This Tuesday I had alot of motivation! In the morning I slept a little bit extra cause Dr. Taylor was coming in the morning to check out a lump on Zaiyah. It turns out it is called a sarcoid, which is a benign tumour. I have to apply this creme that is supposed to burn it off. Then I went to Anita's and help Lisa with a dental on her horse. After that I had to go back to regular work in Gimli. It was a pretty slow day and I didn't do too much. The motivation really started when I started driving home. I stopped at Andrew's shop to clean it but didn't have my key so I had to go home. When I got home I decided to spend all evening outside. It was great! I biked to the farm and viseted with Kathy and saw her baby horses, then I biked to Travis's amd saw his new puppy. When I got home I brough my pups outside and set up a table and ate supper outsite. Then I planted flowers in my bed and in 4 pots. They look great! I also planted my Roma tomato plants. I hope they grow really well cause I want to make lots of salso and pasta sauce in the fall! After that I spend some time with Zaiyah, walking her over a tarp and through our yard to get her used to new things. She did really great. There were TONNES of bugs, it was crazy. Now alot of them are in the house! I am really happy I spend so much time outdoors lately, I can't wait to do it lots this summer. 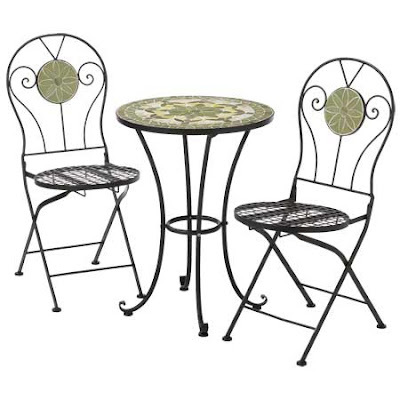 Right not I am looking for a bistro set so we can sit outside more and eat!! Right now I am really hungry and I am trying not to snack on something unhealthy!